B'z during the music video for "girigiri chop". 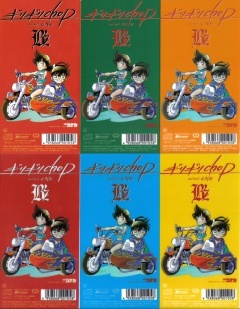 Clips from the video were included during the opening sequence for the Detective Conan anime—a first for the series at the time, and one only repeated again with B'z thirteen years later with "Don't Wanna Lie" in 2011. Koshi's illustration of "girigiri chop" in the 1999 documentary The true meaning of "Brotherhood"?. The "chop" in the title is only meant to convey the forceful nature of the song itself with no ultimately deeper meaning. The complete collection of all six insert cards included with the initial release of the single. The cards feature Detective Conan characters Conan Edogawa and Ran Mouri in art provided by the original artist Gosho Aoyama. girigiri chop (ギリギリchop, on the edge chop) is the twenty-sixth single by B'z, released on June 9, 1999. The single came eleven months after 1998's "HOME", which was at the time the longest such interval for the band and was also the last B'z single to be issued in 8cm CD form. The title song is known as one of the band's most energetic live anthems, during which Koshi and fans often swing towels in unison like propellers in a tradition that began during B'z LIVE-GYM Pleasure 2000 "juice" and continues to this day. Of the band's many rock singles, "girigiri chop" remains one of its most popular and most collected works. A special album version found only on Brotherhood that was retitled "girigirichop (Version 51)" uses an alternate take featuring Mr. Big members Billy Sheehan and Pat Torpey. The song was also performed live on television on five different occasions, including in its "Version 51" form with Mr. Big on the October 8, 1999 edition of Music Station. The single version of the song was later featured on B'z The Best "Pleasure II", B'z The Best "ULTRA Pleasure", and B'z The Best XXV 1999-2012. While the title song is a trademark of their live shows, the B-side "ONE" has only appeared during two tours: LIVE-GYM '99 "Brotherhood" and LIVE-GYM Pleasure 2008 -GLORY DAYS-. The popular ballad likewise was collected on The Ballads ~Love & B'z~ in 2002 and was later voted by fans as the third most popular choice on B'z The Best "ULTRA Treasure" in 2008. Both songs from the single were used in the Detective Conan series as tie-in promotions. "girigiri chop" served as the television series' opening theme from May through November of 1999, while "ONE" was the ending theme to the franchise's third film, Detective Conan: The Last Wizard of the Century, the same year. In addition to being collected on various B'z compilation albums, the songs have been found on theme collections for the series as well: both appeared on The Best of Detective Conan while "ONE" appeared on The Best of Detective Conan ~The Movie Themes Collection~. The songs were the band's first anime tie-ins since "Mienai Chikara ~INVISIBLE ONE~" was used in the Hell Teacher Nube television series. The music video for "girigiri chop" was filmed in a studio in Los Angeles. In the video, Tak is seen brandishing his Canary Yellow Gison Les Paul signature guitar, which would become the first of many he would create with the company. Clips of the video were also featured in the Detective Conan anime series for which the song served as a theme. Along with "Don't Wanna Lie", only B'z has appeared in the opening sequence as themselves for any of the series' many openings. Additionally, the production of the song is covered in depth in the 1999 feature documentary The true meaning of "Brotherhood"?, filmed during the writing of the album and the subsequent tour. The cover features a new customized B'z logo in an Old English style, which was the first deviation from the standard logo in some time. Of note is also that Koshi Inaba began be credited as "KOSHI INABA" beginning with this single, whereas he had previously been credited as "KOHSHI" in earlier releases featuring English credits. Additionally, each copy of the single also contained either an opaque red or transparent dark red, blue, yellow, green, or orange card featuring characters from the Detective Conan series as well as a number to obtain a ringtone on the back. At release, the single debuted at the top spot on the Weekly Oricon Singles chart and became their twenty-second consecutive to do so, with sales breaking 500,000 in the first week alone. The release was the third highest-selling for June 1999, eleventh for July, and 19th overall for the entire year of 1999 according to Oricon. The single spent eleven weeks on the chart and has since been certified Triple Platinum by the Recording Industry Association of Japan. In 2013, "girigiri chop" was one of four B'z songs to be released for guitar-learning video game Rocksmith 2014 on Xbox 360, PlayStation 3, and PC. The song was packaged in a three pack of downloadable content alongside "juice" and "Easy Come, Easy Go! ", joining "ultra soul" that was already available with the game itself. Organized as a four-piece band composition, "girigiri chop" is one of the most enduring B'z rock songs. The unusual title was explained by Koshi as him merely wanting to convey the "destructive power" present in the hard tune of the song and that no deeper meaning was intended. As a high-energy rock song, "girigiri chop" has become one of the band's most-performed songs at their LIVE-GYMs. Typically, it has been included near the end of setlists at peak energy moments of shows. Home video performances can be seen on more than ten releases, including prominent showings during 2006's MONSTER'S GARAGE, 2008's GLORY DAYS, and 2013's ENDLESS SUMMER tours. The song's only alternate version is found on Brotherhood under the title "girigiri chop (Version 51)", which is a refreshed version utilizing a different take of the recording sessions and featuring Mr. Big members Pat Torpey and Billy Sheehan on drums and bass, respectively. Despite being produced around the time of the Brotherhood sessions along with the title song, it was not included on the album. The writing, recording, and production of the song is documented in the documentary feature The true meaning of "Brotherhood"?, which also features a glimpse at a demo for an English version. While one of the band's most popular ballads, it has only seen the live stage during 1999's Brotherhood and 2008's GLORY DAYS tours. During the commemorations for the band's 20th anniversary, fans were encouraged to log onto a special campaign website and vote for the songs they most wished to see on a sequel to 1998's likewise fan-selected album B'z The Best "Treasure". The album, made up of songs not found on B'z The Best "ULTRA Pleasure" which contained mostly singles, featured the thirty songs that received the most votes. When the results for what would make up B'z The Best "ULTRA Treasure" were announced, "ONE" finished in third place out of hundreds of songs, being bested by only "Brotherhood" and "Koi-Gokoro (KOI-GOKORO)", which had come in at the top spot in 1998's voting. A re-recording featuring members of American rock band Mr. Big—Pat Torpey and Billy Sheehan—and found only on Brotherhood. LIVE-GYM 2002 "Rock n' California Roll"
LIVE-GYM 2003 "BANZAI IN NORTH AMERICA"
This page was last modified on 3 June 2018, at 21:25.